I hate that this sentence must now be in the past tense: Lucius Shepard was one of the great American writers. It's hard to find words, even though I've had 24 hours to search. Only under the influence of a narrow and philistine Naturalism can we ask why an artist shows life at a remove and in some established genre. The transposition of an inner struggle to a duel between persons does not even need a convention to carry it: such changes are made nightly by everyone in his dreams. If one can make of one's tussles with suicidal wishes a drama of love and honor, one has given to private and chaotic material a public and recognizable form. One has made art out of fantasy and pain. For the next twenty years I traveled aimlessly, engaged in bar fights, street fights, insulated myself from the possibility of self-examination with drugs, played in a number of rock bands, married twice without giving the matter much thought, dabbled in low-level criminality, drug-dealing, burglary, etc., and eschewed anything that smacked remotely of the cerebral. Luckily, he found his way out of at least some of that darkness, those difficult decades. 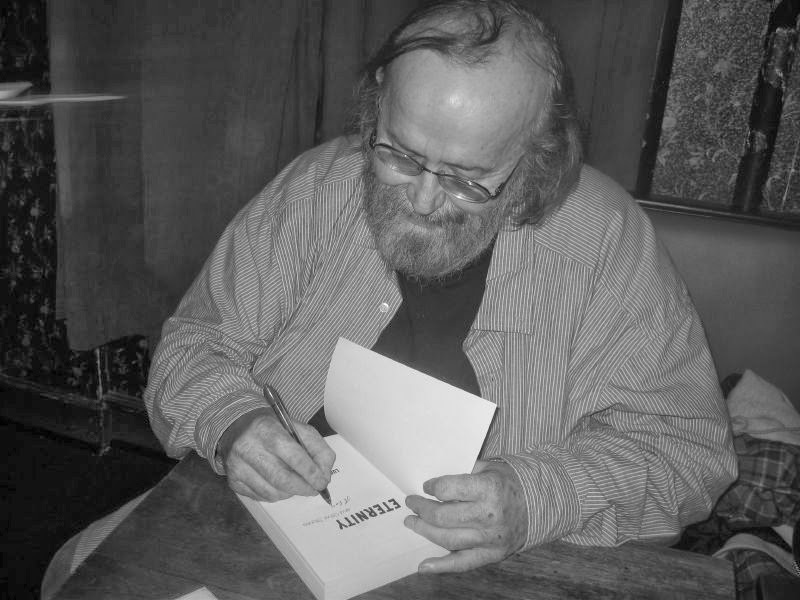 He attended the Clarion writers' workshop and a few years later his stories began to appear in magazines and anthologies, and his first novel, Green Eyes, was published as part of the resurrected Ace Specials line that also brought out Neuromancer and Kim Stanley Robinson's first novel, The Wild Shore, among others. I could try to be objective here and talk about the specific qualities of Lucius Shepard's writing that set him apart from most of his peers for me — the long, languorous sentences, of course; the precision of the imagery; the complexity of form; the rich social world implied from the texts; the fascination with the perils of machismo; the great variety of types of stories unified not by genre but by vision and even, to use a rather antiquated term, moral conviction; the sheer imaginative force the best of the work displays. Maybe another time. It feels too cold and academic. Too un-Lucius. He hated analysis that got away from the practical. His entertainingly curmudgeonly movie reviews were always based in a very personal voice, producing the sense of somebody talking to you from his own experience, hoping maybe that his experience could connect with, enlighten, enliven, enrage your own. I'm not (yet) interested in being entertainingly curmudgeonly, but I can't speak of Lucius Shepard right now without speaking about what, and how, his work meant to me. I started reading Lucius's stories when I started reading science fiction. My mother's boss subscribed to Asimov's and loaned me a few issues. 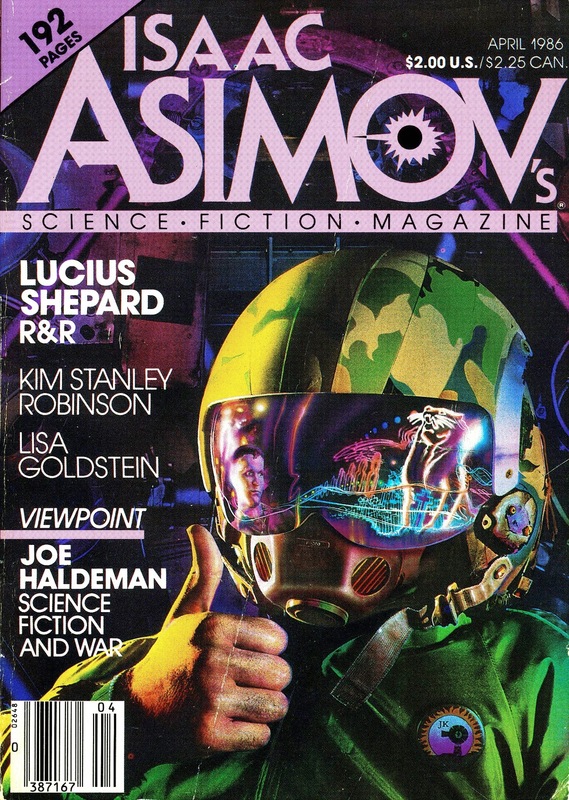 That first batch included the April 1986 issue. The cover story was "R&R". I don't think I read all of "R&R" then — I was too young, it was too dense — but I gave it a good shot. I was, after all, just getting over my infatuation with G.I. Joe and Rambo, and so J.K. Potter's cover and interior illustrations for the story grabbed my interest immediately. (That cover is seared into my brain.) I did start reading Shepard pretty soon, though, because once I was a confirmed sci-fi nerd, my parents let me join the Science Fiction Book Club, and one of the first books I got was Gardner Dozois's Year's Best Science Fiction: 3rd Annual Collection, which included two Lucius Shepard stories, "The Jaguar Hunter" (the first story in the book) and "A Spanish Lesson". I wanted to know what "good" science fiction was, and the presence of two stories meant this was a major writer, so I studied those stories intensively. I don't remember what I made of them. I think I thought they were slow, but there was something alluring in them, something that wouldn't let go of me (and that never let go of me). A few years later, I got a paperback copy of The Jaguar Hunter, which collected most of the best of those early stories (the paperback omitted "R&R", which had been incorporated into Life During Wartime, a book I picked up, but to this day have never completely read because some genius at Bantam Spectra decided the whole nearly-500-page book ought to be in san serif font. It's ghastly!). By that time I was in my mid-teens, had become a better reader, and followed Shepard's career closely. "The Man Who Painted the Dragon Griaule" and "The Scalehunter's Beautiful Daughter" were particular favorites from the early years, but many of the novellas of the 1990s also wowed me and wooed me, bringing me back to science fiction magazines even when I had claimed to move on to better things. The stories were vivid and gnarled, unpredictable, sometimes vexing in their ambiguities, their complex dance with the conventions of narrative form. They clung and haunted. "Skull City", "Barnacle Bill the Spacer", "Beast of the Heartland", "Radiant Green Star" — I still have the magazines and still remember where I was sitting when I read each story. I got to know Lucius a little bit in his last years, mostly via Facebook, oddly enough — it proved to be a pretty good forum for him. I first met him in 2007 when we were the two readers at the KGB Fantastic Fiction series for that November. It felt bizarre to be reading on the same bill as Lucius. I think I was there because there wasn't really anybody else around who was willing to do a reading a couple days before Thanksgiving. Or something. I don't know. I certainly didn't deserve to be on a bill with Lucius Shepard! (Even I just wanted me to hurry up and finish my reading so Lucius could begin!) I was terribly intimidated and terrified of him, even though he was gracious and friendly. But he was Lucius Shepard — one of the greats! I wish I'd had more guts that night, wish I'd chatted with him more, wish I'd gotten him to sign a book. But I was too nervous. We talked a bit at dinner afterward, and then later on we corresponded some. Just as I felt like I was getting to know him, he began to have his most serious health problems, including a stroke. I had plenty of faith that he'd pull out of it, that he'd write again. He had to. How could the world not have the force of his words? I keep thinking back to a moment of childhood: visiting the Avenue Victor Hugo Bookshop in Boston in the late '80s and paging through the Arkham House hardcover of The Jaguar Hunter, which I couldn't afford to buy. $21.95 was a fortune to me then. I looked at the book and looked at it and looked at it. But that's not why I keep thinking about it. What I keep thinking about is this: A year or two ago, I got a pristine copy of that book for pennies. A price I could have afforded even when I was a kid. A first edition, first printing of a brilliant book that ought to be a collector's item selling for a hundred times what I paid for it. I was happy to get a gift for my inner child, but also deeply angry that I could afford it — that it's not as valuable and scarce as it deserves to be just reminds me of how little valued Lucius's work is in comparison to its quality. He should have been a literary star. He should have been recognized as one of the great writers of his generation. Because he was. Sure, sometimes his need for money caused him to sell work that wasn't entirely great, but he should be judged by his best, which is as good as the work of nearly any of his contemporaries (not just in the science fiction field; his work is richer, more powerful, more vivid, more weird, and more meaningful than that of all but a couple of his contemporaries in SF, but it also makes most of the fiction written in any genre or non-genre look unambitious, minor) — and there's a lot of best. (And even the less-than-best is usually quite wonderful for a few pages at least.) His work probably doesn't have the qualities of bestsellerdom, but it should have been — should be — recognized more fully, appreciated more deeply. He won nearly every award in the SF field at least once, but I don't think it was enough, because he deserved a pile of the damn things. He deserved other awards, too, not just genre ones. But even within the genre that he ended up (imprisoned?) in, he wasn't as well known as he should have been, nor was his accomplishment recognized as fully as it deserved. The same could be said for plenty of people, yes, but I've felt for a long time that it's especially unjust in Lucius's case, because the work is so varied, so powerful, so special. So here we are, then, in a world without Lucius. We've got the words, though, the pages and the books — and we ought to do something with them — we ought to seek them out and get more of them back into print, we ought to harangue critics to write about Lucius's work with the depth and seriousness it deserves — and, too, we ought to sing songs in his honor and spend a bit too much time in a bar now and then, we ought to howl at the moon, we ought to seek out some good movies, we ought to scowl at liars while recognizing what liars we are, we ought to stand up for the weak, we ought not ever get too settled in ourselves, we ought to write long sentences, we ought to be gracious, we ought to be angry, we ought to fight against borders and pigeonholes and easy expectations, we ought to stand brave against the violence at the heart of our selves, we ought to dream and laugh and spare some time for people different from us, we ought to seek to be more and better, to escape old pasts and old resentments and, most of all, old failures — because we're what's left, and we're still here, and the words still live. We had reached a spot overlooking a strip of white beach guarded at both ends by enormous boulders. The blue sea stretched tranquil and vast to the horizon, and the cloudless sky, a lighter blue, empty of birds, echoed that tranquility. Nothing seemed to move, yet I felt a vibration in the earth and air that signaled the movement of all things, the flux of atoms and the drift of unknown spheres. An emotion swelled in my breast, nourished by that fundamental vista, and I felt, as I had not in years, capable of belief, of hope, of seeing beyond myself. Jane linked her arm through mine and rested her head against my shoulder, and whispered something that the wind bore away. And for that moment, for those minutes atop the hill, we were as happy as the unhappiness of the world permits. Notes on a Sentence from "The Death of the Moth"
"Life’s too short for anxious score-keeping"